How to become “tracking-smart” to learn what helps and what hurts. How to know what makes you feel good and ask for what you need. Your Coach, Tami Stackelhouse, has a radically different perspective to offer: true, honest embracement. This may be very hard to hear, especially if you are in a lot of pain. We know how impossible this sounds. 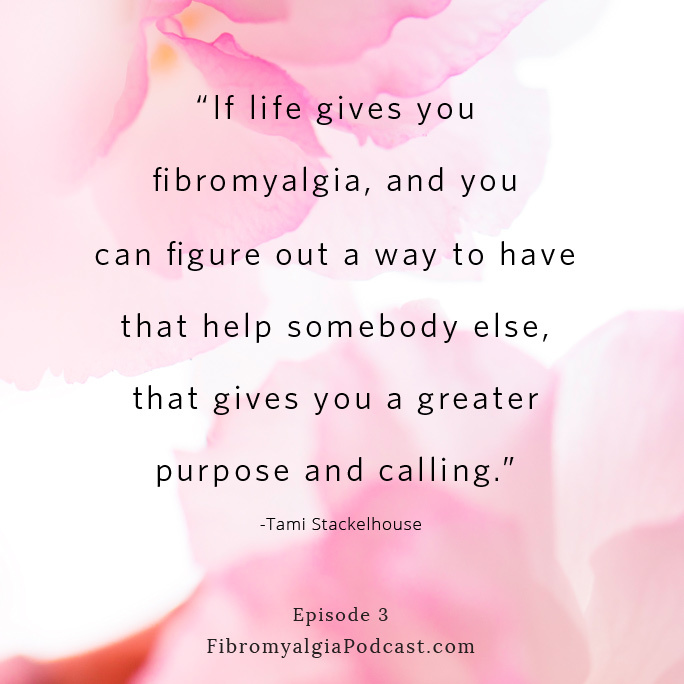 So, listen gently, and learn how Tami took the tough, debilitating “life sentence” of fibromyalgia and turned it into a blessing for herself and others. Get a free copy of Tami’s book, Take Back Your Life: Find Hope and Freedom From Fibromyalgia Symptoms and Pain. “How Can I Have More Energy?” (chapter 4) contains step-by-step instructions on how to use a pedometer to help you manage your energy. “How Can I Help Myself?” (chapter 7) contains the Joy List exercise to help you add more joy to your life. Tracking tools mentioned in this episode are available here. Below you will find both a full transcript and video of the episode. 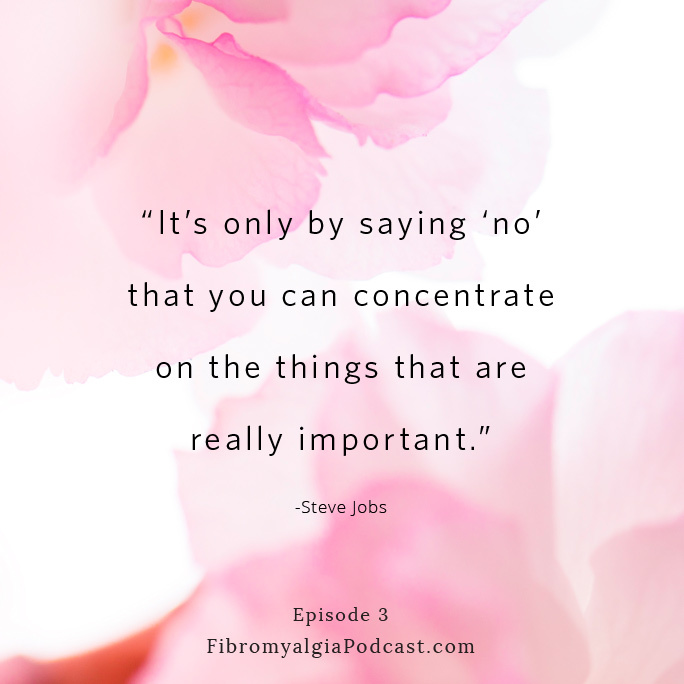 You’re listening to the Fibromyalgia Podcast, Episode 3. 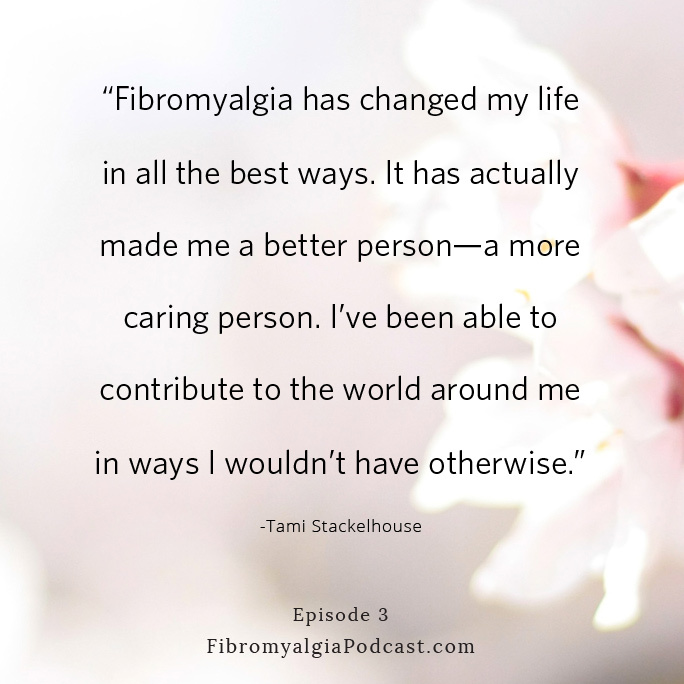 Welcome to the Fibromyalgia Podcast! I’m your Coach, Tami Stackelhouse. Today we’re going to be talking about my story, so that you can learn a little bit more about me and how we got here. To do this, I have invited a friend, Lee Hayward, to interview me. She is someone I have known for the last couple of years but she doesn’t really know my story. I think that will bring out a bit of fresh perspective. Things, maybe, that I hadn’t thought about in years, and give a different insight into who I am and how I got here. Thanks for doing this Lee. LH — Thanks for having me. This is exciting. TS — Awesome! I will just turn it over to you at this point, and I will be the guest. [01:34] LH — Okay, alright. This will be my show now! So, it is funny, because you and I have known each other for quite some time. We know lots of fun, intimate details about each other, but I actually do not know certain parts of your journey with fibromyalgia. I want to hear about how this began for you and how you figured these things out. I think one of the things that I have found, by just getting to know you and doing our work together, is that you have such an interesting take on what fibromyalgia is for you. I would love for you to start by sharing that with us, and then we’ll go in to your journey. [02:22] TS — Alright, awesome. 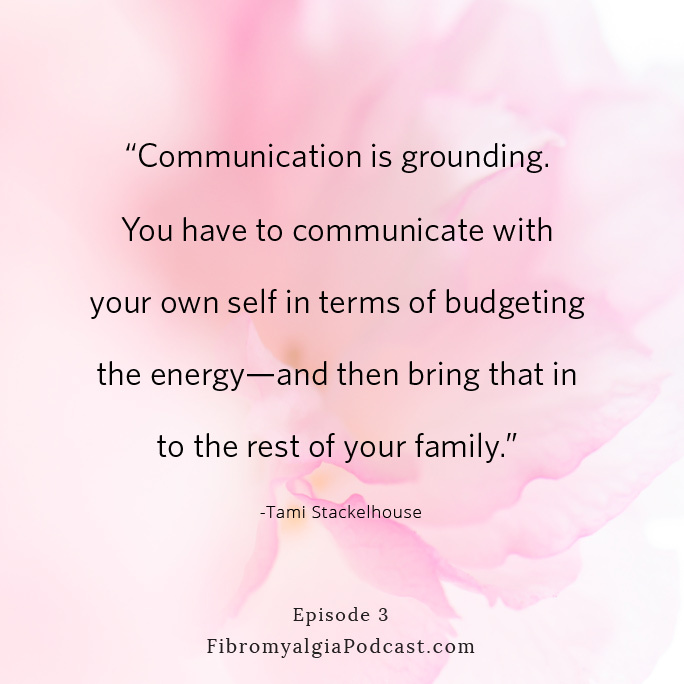 This is something that I actually don’t talk about very often, because I think it can be very hard for a lot of fibromyalgia patients to hear. It’s not an easy thing, especially if you are newly diagnosed and if you are in a lot of pain. What I’m about to say may sound very challenging—but the honest truth is, when I hear “fibromyalgia”, I smile. It’s like you’re talking about a friend of mine. I really DO love fibromyalgia. I know it sounds really weird, but I really do. Fibromyalgia has changed my life in all the best ways. It has actually made me a better person—a more caring person. I’ve been able to contribute to the world around me in ways I wouldn’t have otherwise. I’ve been able to make a difference in people’s lives that I wasn’t making before. I’ve been able to meet all these amazing people. I’ve been able to go to amazing places and do amazing things. I don’t know if I would have written my books if it hadn’t been for fibromyalgia. So, for me, fibromyalgia has brought so many blessings that I actually love it. [03:45] LH — Well, that is interesting, because you hear of people being diagnosed with various things—or you have been diagnosed with something—and I think we all have a way in our head of how we think we would deal with things. A lot of it is just survival: “I’m going to get better.” But you’ve taken it to one step more, which is really true, honest embracement. I think that is what I have been able to watch. And you have made such an impact on so many people. So, that is really cool. Thanks for sharing that. [04:26] LH — So… I want to know: when were you first diagnosed with fibromyalgia? And when did you start to figure this out? TS — I didn’t get an official diagnosis until early 2007, but I can look back over my life, and I can see fingerprints all along the way. I was one of those kids that was always sick, always had things going on. I was diagnosed with chronic headaches when I was a teenager. There was always something not quite right physically. I started doing my own research when I was in my teens to try to figure some of this out. I think the first time I asked a doctor if it could be fibromyalgia was probably in 2000 or so. It took me a good seven years to finally get an actual diagnosis. LH — Were you the first one to mention that word? TS — Yeah, I know. Right? LH — Well, that is fascinating, because… how much longer would you have been sitting around waiting if you hadn’t done this proactive work? [06:15] LH — Yes—and this is skipping ahead a little bit—but you and I have talked a lot about the idea of full integration both in business and life. I am obsessed with this Steve Jobs biography, and anybody who has read that or knows anything about Apple, knows how they really operate in a way of full integration. I kind of love that you sort of started that on your own. How have you, in this process, learned who needs to be on your team? TS — Oh, that’s such a good question! See? This is why I invited you to do this! How did I decide who needed to be on my team? Well, one of the big things for me, just the way I’m wired and the background I have, is this idea that life is a grand science experiment. Let’s try something and see what happens. Does it help? Does it hurt? And then make adjustments and go from there. A lot of figuring out who needed to be on my team… I was looking at areas where maybe I wasn’t quite where I wanted to be. I had adopted this idea that, if I could get all the individual parts of me working as well as possible, then the larger scale me would work as well as possible. So, I started looking at some of those little things and saying, “Okay, my sleep isn’t awesome, so let’s find somebody to help with my sleep.” And, “I have all of these chronic headaches, so maybe I need a neurologist to help me with chronic headaches.” Or whatever those little things were. I tried to look for the gaps. The other thing that I did was I was very proactive in taking people off of my team. LH — Good! That is very important. Taking people off of my team was almost as important, or more important, than who I added to my team. If I had somebody where I felt like they just weren’t respecting me or not listening to me… The doctor who was like, “I don’t really know what that is but let’s check you out.” Or, “I think this is just depression from your stressful job.” See? I’ve got to replace that person because that’s not helpful, right? [08:49] LH — I imagine, too, that there is a decent amount of—and we’ve talked about this in other areas too—of what you should be doing. You feel like you put all these SHOULDS into place—but they’re not necessarily the right path in particular. TS — For sure. Nutrition is a big one: what we eat, how we move. Those seem to be the two big things every person on the planet is told. You need to change what you’re eating and change how much you move. In other words: diet and exercise. For me, those pieces were a part of the puzzle—especially at first, they were a big part of the puzzle! But over time, they have been less important than other things. I think it really is important to take that mindset of “this is a science experiment”, and see what actually gives you a benefit. If it helps you a little bit, that is still worth noting, because lots of little bits add up over time. I think a lot of times we discount the little improvements. You can still get to one hundred percent, if you’ve got fifty things that get you two percent, or a combination thereof. I think a lot of people are looking for the big magic bullet that is going to fix everything, where I was happy to just get a little bit here and a little bit there. I knew that if I just added up all those “little bits,” like pennies in a jar, eventually you’ll add up to something. [10:25] LH — Did you have anything that you might recommend to people, ways where you were tracking things that you tried? Were there ways that you could track, “Here are the positive upswings that we’re looking at”? TS — There were a few things I did tracking-wise to help me know what was making a difference. I was tracking my pain levels and my energy levels. I actually have a worksheet for my clients that I use. Those of you that are listening to the show, we’ll include the link in the show notes so you can see some of these tracking tools. But, I think it’s really easy for us to forget, right? Like, what it actually was—and our memory gets fuzzy. This is true for everybody, but even more so when you’ve got fibro brain, which is fuzzy anyway. Right? So, actually, numbers tracking what my pain levels were and not so much worrying about what my pain level was at any given moment, but what the trend was. Is it getting better or is it getting worse? [11:40] TS — The other thing that I used—which kind of happened by accident, but has been such a major help for me—is actually using a step tracker. This is something that goes through so many fibromyalgia patients. “I have a flare, now WHAT THE HELL DID I DO?!? I have no idea!” What I discovered is, I could go back and look at the activity the pedometer tracked. That day that I thought I was “just driving the golf cart”, and I wasn’t really doing much—I actually walked three times more than my normal amount of steps. TS — So, when you do something like that, like three times the amount of activity that you normally do, of course, you’re more tired. Of course, you might be in more pain. So, using that pedometer and tracking my steps was HUGE. I started to see my steps kind of like dollars. I had a certain budget for the day of how many steps I could use. Let’s see, going to Costco is going to cost me a thousand steps, but if I only have two thousand steps in my budget for the day—is that how I want to spend them? You know, I can’t go to Costco twice in one day! And all of those things. I started to think about budgeting my energy the same way I think about budgeting my money. That really helped me a lot in terms of managing the energy that I did have—making better choices on what I wanted to spend my energy on. Rather than just running out and saying, “What happened? Where did it go?” I knew exactly what I had spent it on. I started to have more consistent energy, so that I could plan for things. I could say, “Yes, I would love to have lunch with you in two weeks,” because I know my energy is going to be consistent enough that I can actually do that. [14:24] LH — That’s a cool story. You mentioned your husband; I know you have a lovely husband. LH — What was it like for you guys? You were married when you were first diagnosed. I know it was a very significant life change for you. What was it like for you guys, as a couple, and for your marriage? TS — It was super, super… interesting. We had been married about six months, maybe a little bit longer—and we met on the internet. He lived in Florida; I lived in Oregon. He moved to Oregon about a month before we got married. At the point I was diagnosed, we had been living in the same town for only seven or eight months. It was definitely challenging. I think the thing that was most challenging for him, which I totally get, is the fact that it changed from day to day what I could and couldn’t do. There was nothing on the outside to tell him whether it was a good day or a bad day. One day, I would be like, “Yeah, no problem.” We could park anywhere and walk to the store. Or, I’ll do my own things around the house. Then, the next day, I’m like, “Can you get me a glass of water?” I just can’t do as much. To him, it’s all the same and very confusing. Why today can you not do this, when you did that exact thing yesterday? Just the fluctuations of my energy and my pain levels, and it being something he couldn’t see… it was really tough. [17:03] LH — That’s really challenging. I’m sure you probably talk about this with your clients, but I’m curious… What have you learned in terms of how you communicate that to a spouse or loved one, and do it in a way that doesn’t make you feel like, “YOU CAN’T PARK THERE! I CAN’T!”? You want to be empowered and feel good about yourself, but also have that person that you love understand. How do you do that? TS — It’s hard and I think you have to find what works for you. The biggest thing is just that word COMMUNICATE. You can not expect them to read your mind. I know that sounds so obvious when I say it, but if you really think about all of the things you do in life, there are so many times when that is actually what we are asking the people in our lives to do—our spouses, our friends, our family to do—is to read our minds or to read our bodies—and to know what we need. Sometimes, even if we don’t know what we need—and that’s totally not fair! It’s not fair to them and it’s not fair to you, because you’re not getting what you need. The biggest thing is just figure out a way to communicate, to share that. [18:14] TS — The other thing that I think is really important is to make it about you and not about them. I tried very hard to ask for what I needed, rather than talk about what he should or shouldn’t do, which I think is a big difference and feels very different to the person who’s hearing it. I also had to decide what things I just needed to do, regardless—what I absolutely had to have—and be willing to do it for myself, however that needed to happen. If I, for instance, didn’t have enough steps to go to Costco, that responsibility was mine. If he wanted to go to Costco, my responsibility was to sit in the car and wait—or not go at all… or whatever—and not really expect him to change what he’s doing. Like, if he wants to go, he can still go; that is totally fine. I just need to stay home because I have used all my steps for the day. [19:22] TS — And, really…. be good choosing to do what it is that you need to do, and not expecting other people to change what they’re doing because of it. Which means, of course, that we must do a lot of inner work on ourselves, on being okay with that. The more you can, and the less drama there is around that, the easier it is to get what you need. I think the part where a lot of people get in trouble is where we assign all of this emotion and drama to simple things. Thinking, “I’m going to choose to not go to Costco today because I’ve used ALL my steps”… rather than all the other stuff. LH — Yes, it’s different. It’s a little bit of a shift. LH — And for me too. Communicating is not an easy skill no matter what your scenario is. My husband and I have gotten in to the car to go on a road trip, and we’re from the same town. One of us was going to one parent’s house, and the other was going to the other parent’s house. You know, communication is grounding. 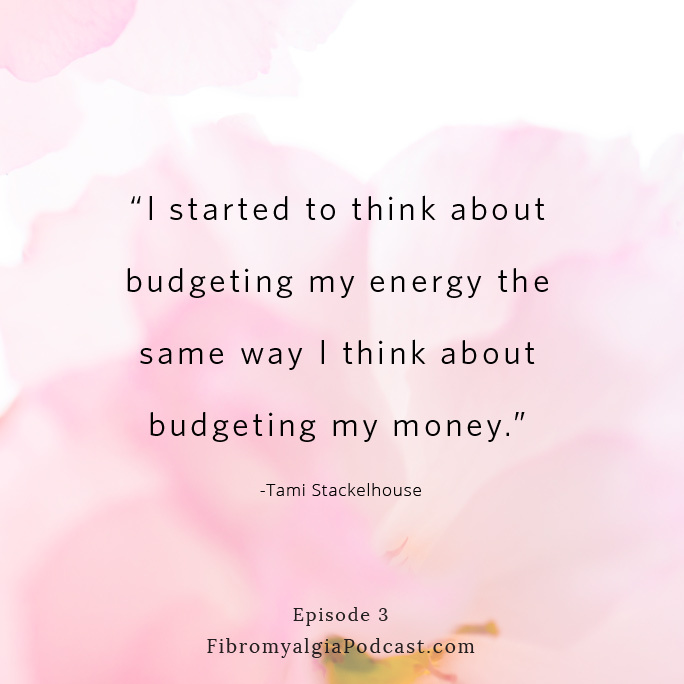 I think it’s good to hear that you have to communicate with your own self in terms of budgeting the energy—and then bring that in to the rest of your family. [20:37] TS — Absolutely! There are so many creative ways that you can communicate, too. I had one client who was very tired of always answering the question, “How are you feeling today?” Most of the time, it’s not very good, you know? And, it can be annoying. I had a couple of different clients do a couple of different things. One had this indicator dial on the fridge that she would use… so her family could just look at the fridge and see how she was doing that day. 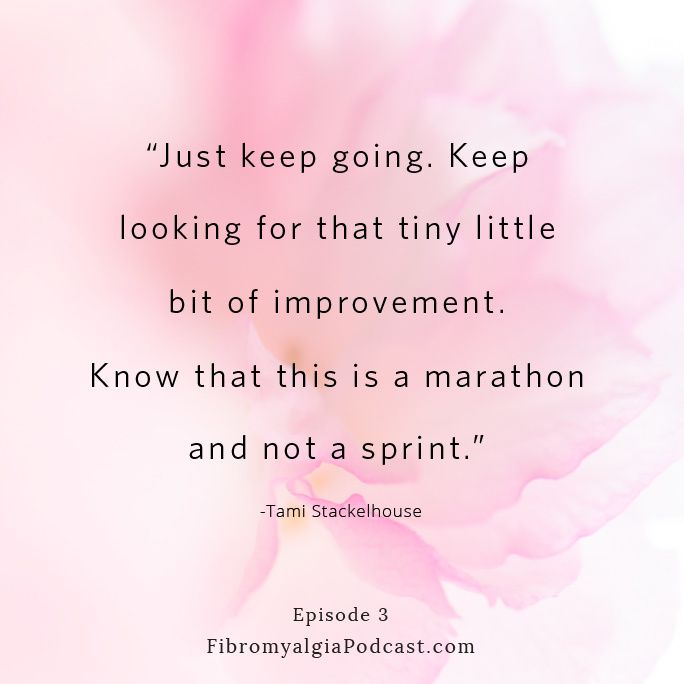 [21:58] LH — Now, obviously, you’re an amazing coach and doing all these great things… but when you were first diagnosed, what was it like before you had the outlook of, “I love fibromyalgia!”? TS — Yes, ‘cause it was not always that way! LH — Not too much. I told this story, I think it was in Episode 2, about my husband giving me a talking to, because I was complaining about my body. I was complaining, as we girls often do, especially when you’re in a body that isn’t quite working right. “It’s defective! I’m FAT!” All the things. He was like, “Every time you do that, it puts me down, because I chose you and I think you’re beautiful.” And, so, that was like, uh… WHOOOPS! LH — Oh my gosh. That’s so funny! I mean, it’s SO true. TS — YES. YES. EXACTLY. That was a big thing, starting to shift to try to see myself from his perspective, rather than from just my perspective. [23:16] TS — The other thing I did was just start to look at, if this is what I have—if this is the diagnosis that I have—then what can I do to make the most of it? At the very beginning, I’m thinking, “How can I get rid of this? How can I overcome this completely? How can I heal this?” I was looking at everything I could find to try to improve. I think the mind shift that happened for me was really looking at this as my new job. I hadn’t been able to work. I had nothing else to do; I just made getting better my full-time job. I journaled about it. I read books. I did research on line. That was my job—to get better—and what was it I needed to do to accomplish that? [24:27] TS — I really tuned in to my body, and I tried to really tune in to: What makes me feel better? What makes me feel worse? What do I need? Do I need more sleep right now? Do I need to sleep in? What do I need to do? That has been such a gift. It’s hard to do that tuning in when you are in so much pain, but, if you can, your body will totally tell you what it is that you need. For me, it doesn’t matter what is going on, I know exactly what my body needs and how to get to where I want to be. If I’m in a flare, I know exactly how to get out of it. If I’m going to do something that is extra strenuous, I know how to make sure I’m going to be okay the next day. That is a skill you have to develop, and for me that was really the attitude that I took at the beginning. [25:27] TS — It definitely wasn’t easy. One of the things that I discovered during that time was that I could really only leave the house once a week. It didn’t matter whether I was going to get my hair cut, or going to Costco, or going to a doctor’s appointment. I really could only leave the house once a week and stay feeling semi-decent—I won’t say good ’cause I wasn’t good yet—but more than once a week would actually make me feel worse. And, really, ask for what I needed. That was tough, realizing I could really only leave the house once a week and still maintain how I felt. It didn’t matter if it was a fun thing, or a not fun doctor thing, or whatever—and I was the one who had to stick to that. There wasn’t anybody else who could help make sure I did that thing. It was me that had to be good about keeping those boundaries. LH — It’s interesting, because you had to educate yourself so much, and then you had to give yourself permission to just totally be you and do you and do what is best for you. [27:20] LH — So, I know you travel all over the place. You’re very active. You leave the house many more times than once a week now. TS — Yes, I do. LH — How did that happen for you? How do you go from only being able to leave the house once a week to, literally, you can get on the plane and go speak and be fantastic and impact all of these people? [27:41] TS — The biggest thing to know is that it took years. It wasn’t fast; I didn’t go from not being able to leave the house but once a week to traveling all over the world in a week or anything like that. It has taken me years. That was, probably, eleven, twelve years ago. It’s been awhile. Every time I get to a place where I feel like, “Oh my gosh! I am so much better. I am awesome now!”… There is even MORE awesome. Even though I am doing all of these things, I fully expect that there is even more improvement I could make at some point in my life. I am continually looking for what can I improve—even if it’s just a little bit. I love the story of the tortoise and the hare. I feel like that’s me; I’m the tortoise. I just keep plodding along. Nothing super fancy. Nothing super dramatic. No “all of a sudden I did this thing and it changed my life.” It was just one little step at a time… but over the course of twelve years, one little step in a certain direction takes you a long, long way. Right? [30:00] TS — There have been changes that people wouldn’t see from the outside, changes that have happened in the last two or three years, especially in regards to my travel. For example, I haven’t taken daily pain medication for a very long time, but when I would travel, I would do that as a preventative measure. I’m going to be stuck in an airplane for six hours, so I’m going to take some pain meds so that when I get off, I can actually move! I did still have to take it one or two times on that trip—it was about a week long trip—but I didn’t have to take it as much as I thought I would have to take it. So, I’m thinking, “WOW. That was an improvement.” Nobody on the outside actually saw that, but for me it was like WOW. Now, the only time I really have to take pain meds is if I sleep on a bad bed! LOL That is the thing that will totally kill me every time. It’s just looking for those little things. [31:28] LH — Yes, those little things—and you had to do so much of the education. Obviously, this has now become your job and your life’s work, but if that education would have existed—and if you didn’t have to go do all of those things—could you have done it faster? That process definitely made things take longer. A lot of things—like accidentally discovering that a pedometer can help me manage my energy—if I’d had that from day one instead of two years, three years in, that would have saved me two or three years. This is just a wild guess off the top of my head, but I would guess I could have gotten to where I am now in half the time, if all of the things I know now had been available to me at the beginning. [32:48] LH— Is that part of why you became a coach? TS — That’s exactly it. It was the strangest feeling when I first started feeling better. I have this very clear visual image that I was walking around with this beautifully wrapped present in my hands. The kind with the shiny paper and the big bow. I felt like that was the gift I had been given—of being able to feel better, and being able to go out and live my life again—and I just wanted to share that gift with other people. I knew how hard it was for me to find out those things—and I’m a smart cookie. I love science. There were a lot of things that I had going for me, that maybe somebody else doesn’t. Maybe, they don’t know where to go to look for those research articles. Or, maybe, they don’t have the science background to understand what’s in it. Or, maybe, they just don’t like it. Maybe, they don’t have the same troubleshooting background and skills that I had from working in a software company and having to do tech support. [34:08] TS — There were a lot of things that I had that I think made this easier for me that I knew not everybody has. I just wanted to share that. I wanted my pain and my journey to make a difference for somebody else—because as soon as that happens, it becomes bigger than just me. It’s not just this thing that happened to me. It becomes a thing that is a blessing to other people. [35:21] LH — You are literally the walking encyclopedia for fibromyalgia! Now this is my heart, but one thing that you literally are the walking thing of is fabulousness and looking amazing!! That’s not always easy when you just don’t feel awesome. I’d love for you to mention just what kind of journey that’s been like for you. I mean, look how cute you are! You know there’s a lot that goes in to that. Number one: feeling comfortable in your skin and in your body, especially when you have pain. Then, number two: really feeling good about who you are. TS — Yes. Yes. Definitely. Sometimes… there are some days—I mean we all have them!—where you just feel like you want to stay in your pajamas all day. There were way too many of those days when I was first diagnosed. I remember one day in particular, when I decided to file for disability. I was in my pajamas, and it was the end of the day. I am pretty sure I had been in those pajamas for most of a week. It was just the reality of the situation. Then, there were some days where the simplest thing would turn me around. I would be getting dressed in the morning, and I would choose to wear a top that was a little more cute. Maybe, I’m still not going to wear makeup. Maybe, I’m still going to be in my yoga pants. Maybe, it’s just a little bit cuter t-shirt than the others. Then, putting that top on would make me feel like… maybe, I’ll put on a little lip gloss… maybe, I’ll put on a little mascara… One thing would lead to another. Or sometimes the opposite would happen. I remember quite often putting on lipstick or lip gloss. Then, being like, wellllll maybe I’ll do my hair… maybe, just do a little bit. When you look good, you feel better. That is such a challenging thing. We don’t want to assign our worth and our identity to how we look, because there’s a danger there, too. But, when we look in the mirror and we like what we see, we feel better about ourselves. There’s just really no way around that. I think that’s perfectly natural. Perfectly normal. [38:01] TS — If you aren’t feeling good in your own body, what can you do to feel good in your own body? It doesn’t matter if you’re having a bad hair day or if you have fibromyalgia. I think the concept is kind of the same. What can I do to like how I feel in my body? A lot of it is listening to what actually makes you feel good and what doesn’t. There might be clothes that when you put them on, they might look good in the mirror, but they actually don’t feel good on your body. I have learned a lot, especially working with you [Lee], about what feels good on my body. For instance, the materials have to have a little bit of stretch. I can’t wear a normal, button up, woven shirt. It’s just not comfortable. It just doesn’t feel good. My fibro body needs that little bit of stretch. You know, little things like that: How they fit, where they sit on my body, what necklines are like. Certain things trigger my headaches. Being aware of all that.. and starting to build a wardrobe of clothes where everything actually feels good on my body. It doesn’t matter what I go in and I choose, I still feel good, which makes it easier to look good. [39:26] TS — Also, realizing what it is for you that helps you feel that way. I have one friend that wearing boots makes her feel like a badass. Realizing that fibromyalgia does change what feels good… Another friend of mine loved to wear heels, but she can’t wear heels with fibromyalgia. But, I would ask the question, “What would give you a similar feeling? Maybe you can’t wear heels again… But is it the strappiness of the toes? Could you wear low heel strappy things and kind of get a similar feeling?” Or, you know, whatever that might be. I think it’s important for us to just tune in to what actually makes you feel good, what doesn’t, and then what are easier ways to get there? One of the things that I do often is: I have somebody do my hair. That is very tiring in a fibro body. Washing your hair is a hard thing to do. But, you could find a local beauty college that’ll wash and dry your hair, sometimes for less than ten dollars, and that can just be a nice way to treat yourself. Also, realizing the times when it’s okay to not do all the things. A few years ago, I was talking with one of my clients and she asked me, “Do you get up and put on makeup every day?” And the answer is: No. I don’t, necessarily. When I’m sitting there on my zero gravity chair doing my client calls with my headset on… in some ways, having makeup on makes it a little bit more annoying, right? Like, makeup gets on the headset and whatnot. [41:45] LH — Right now, trending on Netflix is the show “Tidying Up with Marie Kondo.” So everyone is (tidying up)! I read her book years ago. Her whole concept is to do what brings you joy. 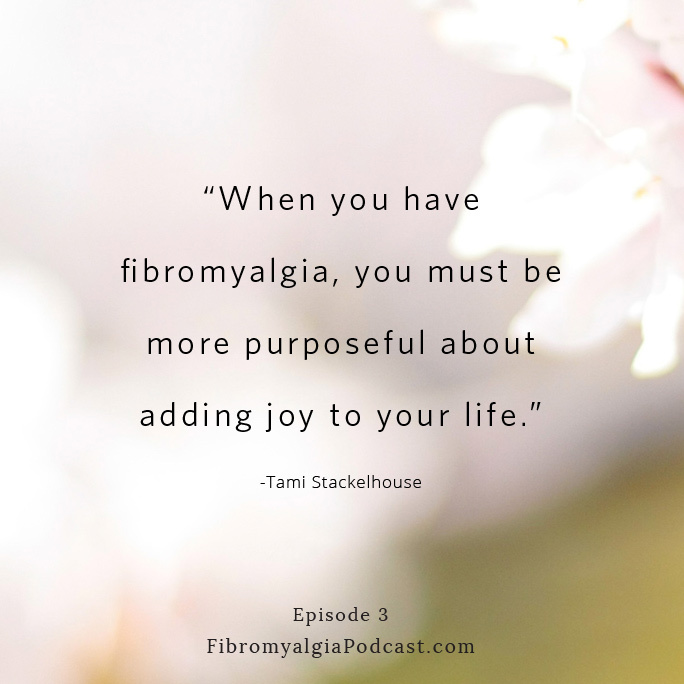 I really feel like so much of what you do—and what you’ve been able to do in your work with fibromyalgia, and as a person with fibromyalgia—is actually pull the joy out of it. Which sounds insane, but that’s what you’ve done. You’ve really sort of brought it in and embraced it. Just talking about clothing or hair or pajamas, even if you aren’t leaving the house, just that little thing that brings you joy. I love seeing you do that. That’s very cool. TS — Yes. I think that for many of us, fibromyalgia can be a massive taking away of things. You know, maybe you can’t eat the things you used to. You can’t do the activities you used to. Maybe, you can’t even do the job or be the kind of mom you used to be. There are all of these kinds of things that fibromyalgia takes away from us. I think we have to be so much more purposeful about adding in the things that bring us joy. [42:56] TS — There’s a whole exercise that I have in my first book about building your Joy List and how to add joy back in to your life. [Take Back Your Life, chapter 7] In my opinion, if we don’t have that joy, then what are we doing this life for, right? We need that fun! The stuff that brings us joy is why we live life. It’s why we do the other things. I would stay up all night long if I was left to my own devices. I am totally a night owl. But, going to bed early lets me do some of the other things that I love. That’s kind of how I see it—finding those things that bring us joy versus the things we have to do sometimes to be able to do that. We have to be super, super conscious of it. We’ve got to be very purposeful about adding those things in. Otherwise, it’s just a very depressing situation. That’s where I think people begin to really feel like prisoners in their bodies—when they don’t have those joyful things they can add in, whatever they are for you. You are a successful entrepreneur. You are a woman who has learned the ins and outs of fibromyalgia, and who continues to learn. What is the one thing that you want people to know, either about you or just about your journey, that is most important to you? 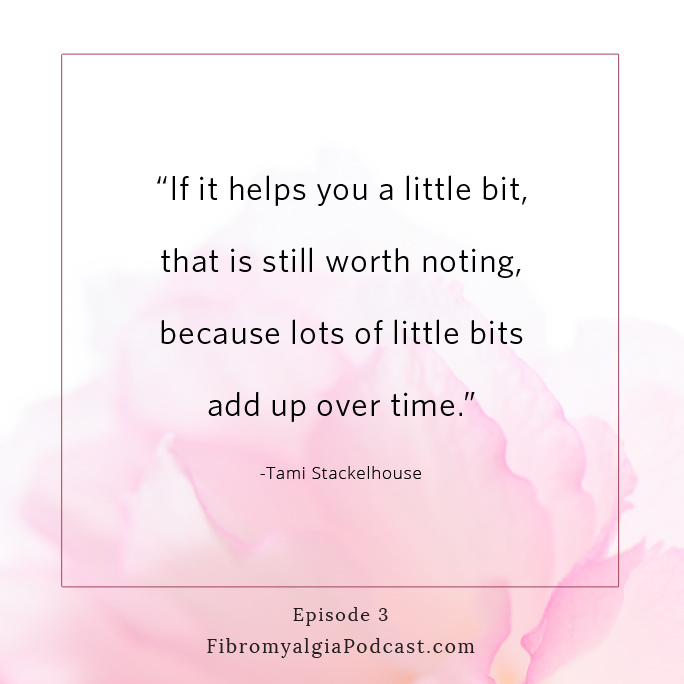 TS — I think the biggest thing, and we’ve talked a little bit about it here, is that where I am and the way I talk about fibromyalgia and the way I talk about my life might seem so far from where you are right now. Know that I was there also and that I didn’t do anything super wild or dramatic. It was just very doable activities, little bit by little bit, over the course of time, and making the choice to continue that path. There were many, many times I would have loved to have quit. Truly feeling your best is a full-time job. Healing is a full-time job… and sometimes you want a vacation! But just continually choose that path. [45:42] TS — Honestly, that is one of the biggest gifts coaching has given to me. It has helped keep me on the strait and narrow in the times when I’ve wanted to quit, because I’m talking about it every day. I’m coaching my clients every day. As I hear the words come out of my mouth—as I’m coaching them—I’m also coaching myself at the same time. Just keep going. Keep looking for that tiny little bit of improvement. Know that this is a marathon and not a sprint. This isn’t, “You’re going to feel as awesome as I do a month from now or a year from now.” It’s a long game that we’re playing here. So, don’t give up. Accept those little wins along the way. Find help if you need it. I know there is no way that I would be where I am if I hadn’t worked with a coach. Hiring a coach was actually the thing that turned everything around for me. I believe in coaching—not just because I am a coach, but because it’s the thing that changed my life: hiring a coach, working with a coach. [46:54] TS — We all need that person alongside of us to cheer us on, because it can get very discouraging when you have been doing the same thing for a year, and you’re just not seeing the improvements yet. I mean, for me, coming off of medications was, I don’t know, a three or four year process. I think that’s the kind of thing that makes it super easy to give up when it takes that long. Know that you’re not going to get to where I am super fast. But you can, possibly, depending on what else is going on in your life, get to where I am… If you look at it as a long game. 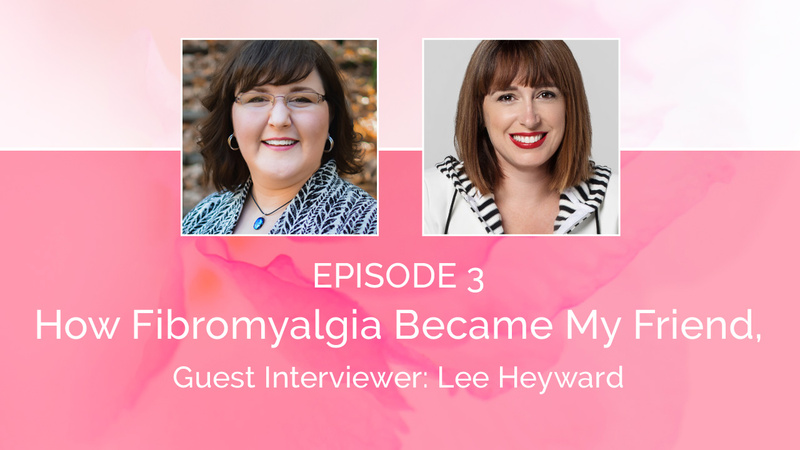 [47:46] LH — Before I met you, I didn’t know that there was such a thing as a Fibromyalgia Coach. What does that mean exactly? TS — Yeah. That’s a good question, and we will be talking about that in future episodes! In a nutshell, it’s like any other coach. I think most people are familiar with the idea of a basketball coach or football coach—maybe even a business coach or a life coach—who really is just helping you get the best out of yourself. A Fibromyalgia Coach is just a coach, but we are totally focused on fibromyalgia. If you are struggling with your fibromyalgia, a Fibromyalgia Coach is going to help you with the exact struggle you are having. We are going to help you find the treatment options that are going to give you your best results. If you don’t have a background like I did in troubleshooting and figuring out—if this helped, if this hurt—that’s the kind of thing a coach can help you with. Look for patterns in your life. Oh, every time you eat tomatoes, two days later your pain is higher. True story, right? But not something you would notice yourself. It was only me seeing a client’s food diary that I was able to see that. We are really totally focused on helping you getting your best life possible when you have fibromyalgia. We are educated in the science. We understand the medications and treatments. We have a whole history of things that have worked for us and have worked for clients. We can ask the right questions to help you figure out what’s going to help you the most. [49:32] TS — Most importantly, we are all fibro people who have been there. When you say it’s a bad day, we know what that means. Or, if you say you’re tired, we know what that actually means—not just, “Oh, I need to go take a twenty minute nap and I’m good.” Right? You’re talking to people who actually get it and can give you practical strategies for how to move through whatever it is you’re dealing with, because it is exactly what we do every single day. LH — Thank you, so much, for sharing this story with me and with the rest of us, and for creating this community. It’s an amazing thing that you are doing. TS — Thank you, so much, for doing the interview! I knew you would ask the questions I hadn’t thought of in a long time. So, it was awesome! You had some good ones! LH — Well, thanks for having me. [50:30] TS — Alright, everybody! Thanks for being here for this episode! On our next episode, I’m going to give you a little overview of what I believe fibromyalgia is. I’m going to share some of my favorite bits of research that have been done and why I find them interesting. That will be our Episode 4. Then, on Episode 5, I’m going to be interviewing Dr. Ginevra Liptan, who is a fibromyalgia specialist and runs the Frida Center for Fibromyalgia. Her clinic is all about fibromyalgia. 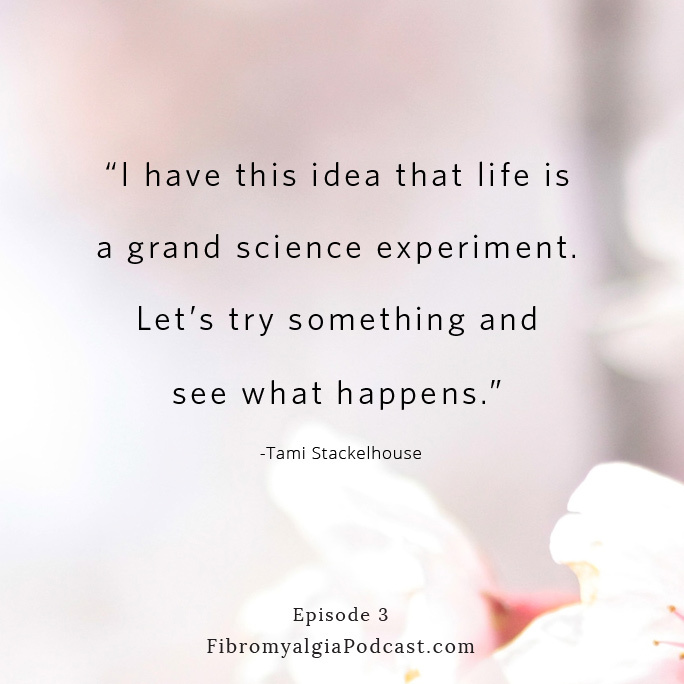 She will talk about fibromyalgia from her perspective, the research she has done on fibromyalgia, and the bits of information she finds super encouraging and gives her some hope for the future of fibromyalgia. 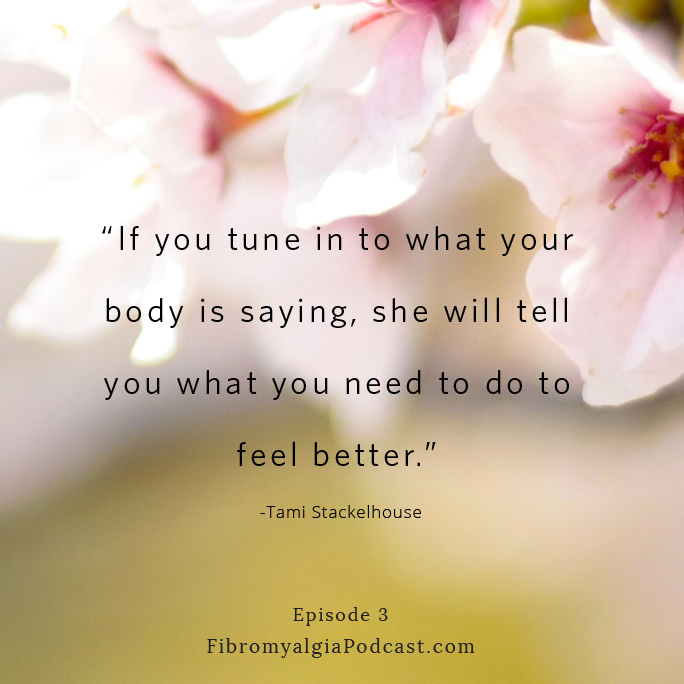 As always, make sure you go to FibromyalgiaPodcast.com for the full show notes for this episode. I’ll have some of those tracking worksheets and some information on how I use my pedometer to help me manage my energy, and all kinds of other goodies for you. If you’ve enjoyed this podcast, consider subscribing on Apple Podcasts to receive each episode as soon as it is available.